On the 71st Anniversary of Mahatma Gandhi’s martyrdom, SCNs in Musunuru through Preranalaya social development center (PSDC) organized a short programme focusing on children and youth who are the future of the nation. Accepting the invitation, several government officials, teachers, students and people of the village joined us for the celebration. We began the programme with a rally from PSDC to Musunuru Mandalam center raising slogans spreading the message of Ahimsa and Satyagraha (non-violence and passive political resistance). 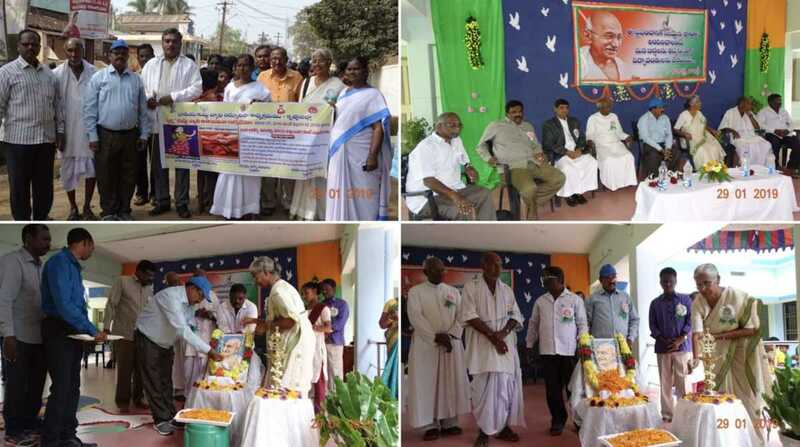 At the center, Mandalam Revenue Officer (MRO) and Mr. Shanthi Bhushanam (Mandalam Education Officer), village elders and Sr. Ann Moyalan honored the statue of Gandhiji for his sacrifice and service to the nation. The rally then returned to PSDC to begin the cultural program on the theme peace and harmony with humanity and the environment. Children of St.Vincent girl’s hostel and students from 6 schools performed dances, songs, and mime in order to instill the values of Gandhi to the people. Prior to the celebration, an inter-school drawing competition was conducted and the winners were given prizes. The drawings about environment/peace were very creative and meaningful which drew the attention of the viewers. During the cultural program, we also conducted inter-school quiz competition on the life of Mahatma Gandhi. The event hosted by PSDC was a great success as the guests and the people appreciated the sisters for their initiative for instilling the values of Gandhiji “Ahimsa and Satyagraha”. Reports like this one of events in India give so much heart to us who once were able to see such programs on our visit there! Thank you so much for sending reports and pictures to us in the States. Thank you so much. We are connected through love, prayers & mutual support.